Ever have those times when God impresses a specific scripture on you? I’ve been having that time this week. 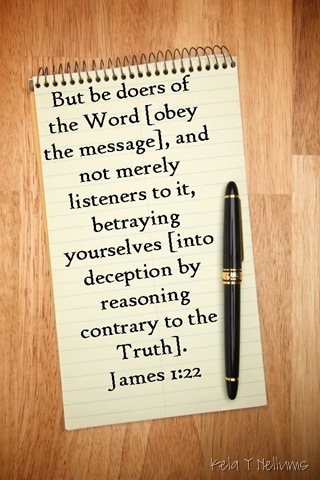 The verse that has been pretty prevalent is James 1:22. I think only James 1:22 because whenever I’ve heard someone mention that passage, that’s all they’ll quote. Difference is, whenever I have heard someone quote it this week, I’d go and seek the Word itself. The Lord will always lead me to read verses 19-25, not verse 22 only. He then draws me to meditate on verse 25. 19This you know, my beloved brethren. But everyone must be quick to hear, slow to speak and slow to anger; 20for the anger of man does not achieve the righteousness of God. 21Therefore, putting aside all filthiness and all that remains of wickedness, in humility receive the word implanted, which is able to save your souls. 22But prove yourselves doers of the word, and not merely hearers who delude themselves. 23For if anyone is a hearer of the word and not a doer, he is like a man who looks at his natural face in a mirror; 24for once he has looked at himself and gone away, he has immediately forgotten what kind of person he was. 25But one who looks intently at the perfect law, the law of liberty, and abides by it, not having become a forgetful hearer but an effectual doer, this man will be blessed in what he does. God! Lord! I always want to be a doer of Your Word. Help me to be receptive and discerning. I ask for Your wisdom in all my ways so that I’m true to Your Word. I want to be an effectual doer because, as Your Word says, I will be blessed in what I do. Teach me Your ways Lord. In Jesus’ name I pray. Amen!